PILDAT’s annual assessment report on Quality of Democracy in Pakistan has stated that ‘it was hoped that 2016 would be the year where Pakistan moves forward towards a positive democratic consolidation through crucially required reforms in key democratic institutions. Instead, the year saw little, if any, improvement in fundamental functioning of key democratic institution. This rendered these institutions largely ineffective in resolving systemic issues behind concerns such as Panama leaks, elected Government’s inability to exercise its constitutional writ on national security and foreign policy domains, and it’s evident failure and perhaps even reluctance in institutionalizing consultative decision-making process. What’s more, the system of democratic governance, once again, failed to even raise amongst its various institutions vital concerns plaguing the country’s journey to peace, equitable growth and prosperity, let alone focus on resolving those to improve the country’s democratic present and future’. Amongst the problematic areas for Pakistan’s democracy, an uninspiring performance by the country’s Parliament and Provincial Assemblies continues. Especially the National Assembly continues to be sidelined as a forum for debate, discussion and resolution of national issues. Perhaps this is also because there is a huge gap between voters’ expectations of their elected representatives, which includes work that should ideally be carried out by elected members of the Local Governments, and the MNAs’ actual responsibilities of representation, oversight and legislation. In addition, major reforms are required in strengthening both the architecture and effective use of the powers of oversight of the Executive, transparency and accessibility of the Legislatures and an in effective Parliamentary budget processes. With regards to performance of National and Provincial Governments, a consistent lack of institutionalization in decision-making on has continued to be a problem in 2016 as well. Consider the Federal Cabinet, which is supposed to meet at least 52 times in a year, but could only manage to meet 6 times during 2016. With regards to performance of the Judiciary, PILDAT’s assessment stated that ‘with regards to cases of a civil nature, there is a need to introduce various kinds of alternative dispute resolutions methods. On the other hand, with regards to criminal cases, there is a need to reform the criminal justice system, along with improving the investigation and prosecution services. However, 2016 has passed without institution of major reforms in the legal process despite the clock ticking on expiry of the 21st Constitutional Amendment’. On independence of media, PILDAT’s assessment has noted that revenue from advertisements is the primary monetary source for all forms of media outlets in Pakistan leading these providers of advertisements to have a huge influence on those outlets. With regards to Local Governments, it was observed that it is a positive development that they have been instituted across the country in 2016, except for in FATA, GB and AJK. However, it needs to be seen whether the powers guaranteed by Article 140-A of the Constitution have been devolved to the third tier as was the intent of the Constitution. This only seems to be the case in Khyber Pakhtunkhwa, whereas the Local Government structures in Sindh, Punjab, Balochistan, Cantonment Boards and ICT remain a cause of concern with regards to their autonomy and devolution of powers. In civil-military relations and democratic oversight of the security sector, 2016 saw the civil-military imbalance deepen further as the Military leadership seemed to be taking the leading role on matters of national security and certain domains of our foreign policy, with the elected Government appearing to act as an auxiliary. However, in an important development and milestone in Pakistan’s democratic journey, a change in Military command was witnessed at the end of November 2016, even though rumours continued to support the contrary. Internal Democracy of Political Parties continued to be a liability for the quality of Pakistan’s democracy during 2016 as well. Even though there were some positive developments to report, such as the intra-party elections of the PML-N, which were undertaken as more of a mechanized ritual, and the establishment of the MQM as an indigenous party, rather than being a satellite run from London, no substantial improvement was noticed. In fact, a major set back was observed particularly for the PTI, which was supposed to be a role model for other political parties when it came to internal democracy. The party’s cancellation of intra-party elections, allegedly because of its agitation campaign was a significant setback with regards to internal democracy of political parties in Pakistan. Therefore, as noted before, the major political parties with significant electoral success, such as the PTI, PML-N and PPP continued to be lengthened shadows of their leaders, with little or no institutionalized decision-making in place within the parties on important policy matters. On performance of the unelected executive/bureaucracy, it was noted that especially with regards to the civil service, including the police, that these crucial arms of functioning of State do not have the same independence that is observed in the case of the Military. Unfortunately no reforms were instituted in this regard during 2016. 1. PILDAT’s Assessment of the Quality of Democracy in Pakistan, 2016 is a report is based on data analysis and scores compiled on the eleven parameters of the Pakistan-Specific Framework, an indigenously developed framework by PILDAT to assess the quality of democracy. 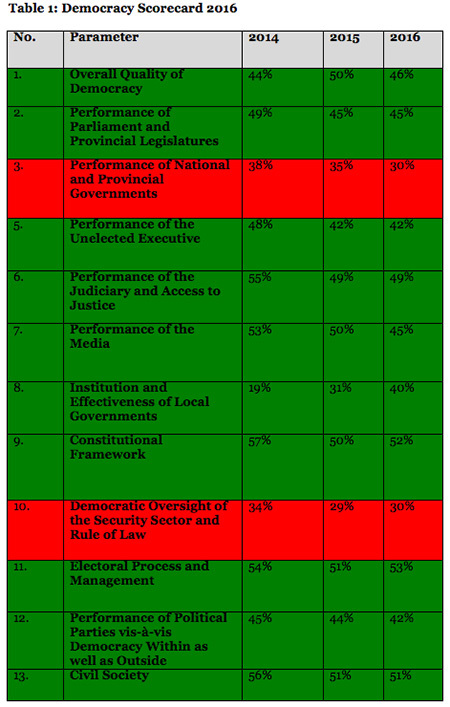 These parameters comprise of Performance of Parliament and Provincial Legislatures; Performance of National and Provincial Governments; Performance of the Unelected Executive; Performance of the Judiciary and Access to Justice; Performance of the Media; Institution of Local Governments; Constitutional Framework; Democratic Oversight of the Security Sector and Rule of Law; Electoral Process and Management; Performance of Political Parties vis-à-vis Democracy Within as well as Outside and performance of the Civil Society.